If you are seeking for the perfect sun protection solution for your arms and you don't want to settle for wearing long sleeve shirts in the sun, try our lightweight cooling sleeves and enjoy full protection from the sun while staying dry and comfortable. Our arm sleeves can block out 99.8% of harmful UVA and UVB rays and protect your skin for long durations of time so that you could enjoy your outdoor activities without getting a sunburn. Package included: 3 Pairs arm sleeves. If you are working outdoors doing construction or waitressing on the beach, use the sleeves for protection. If you need to hide your tattoos or skin imperfections, these sleeves are for you. Can use a neutral detergent to wash in 30C. Soak for 10 minutes in laundry detergent, don't steam or broil. To make it lint-free, please hand wash gently, do not scrub hard, avoid using force, do not scrub with a brush. Please wash separately, avoid cleaning together with the deep color clothing. Dry in shade. UNISEX ONE SIZE FITS ALL - Our cooling sleeves are designed to fit man, woman, and kids. It will fit you if your upper arm is 15-20 inches and your wrist is about 7.5-13.1 inches.If you have a larger bicep, they may feel little tighter. If the sleeves don't fit- we will give you a replacement or a full refund. COOLING & PROTECTING - The UV protection sleeves will protect you from 99.8% of the sun's harmful UV rays, preventing sunburns and mosquito bites. The moisture-wicking properties of the sleeves will keep you cool and dry and prevent heat rashes. 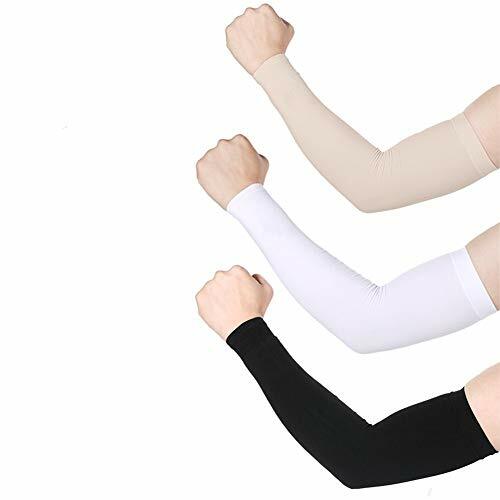 ANTI ROLL STAY IN PLACE - Elaborately sewed with high quality articulated seaming, our arm sleeves were designed to stay on your arm without rolling down, slipping, cutting off blood circulation or leaving marks. Use the thumb slot to prevent movement. Wear these sleeves comfortably all day long. 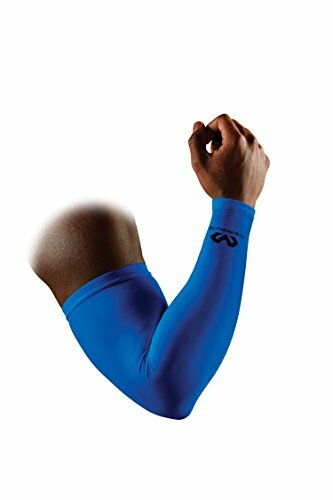 MULTI-USE - The sleeves are great for golfing, cycling, fishing, driving, jogging, climbing, boating, shooting, basketball, tennis and any outdoor activity where you can use the extra protection from the sun. Our sleeves are also long enough to cover your arms over a large area to avoid being burned by the sun. Also, use to cover up tattoos and skin imperfections. SUPREME QUALITY - Made of 92% polyamide and 8% spandex, super lightweight and comfortable, chemical free and completely safe for your skin. This material is breathable, moisture wicking and fast to dry, allowing air to circulate freely through the fabric. Can resist 99.99% of the UV effectively,Protection class is UPF 50+.Keep your skin away from freckles,dark spots,dull and peeling and other troubles,to avoid premature aging. It can be worn independently,easy to wear and breathable.Long use time,reusable after cleaning. This shawl can be matched with many clothes,Great for running,cycling,driving,golfing,climbing,playing tennis and other outdoor sports. 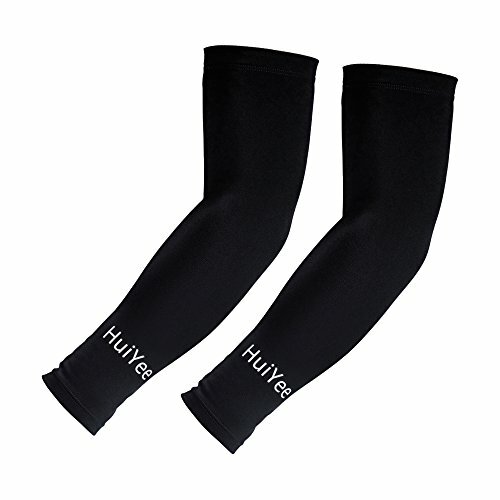 HuiYee ARM SLEEVES--YOUR BEST CHOICE for keeping your arms cool in summer and warm in winter. Recommend to be used in Fishing, driving, hiking, badminton, cycling, golf, basketball, football, baseball, tennis, volleyball, fitness, gym, running, outdoor sports and any other activities. Please note that our sleeves are much longer than others, suggest to measure your arms' bicep before your purchase! Sold in pairs (2 sleeves). All listed products are sold by HuiYee, we guarantee no more questions for full refund if you are not satisfied with our arm sleeves. You don't have any risk for purchase, hurry up to add to your buy box! EXCELLENT WEAR EXPERIENCE: Comfortable in summer while warm in winter if you wear our arm sleeves. Quick-drying, perspiration, light, breathable performance can remove sweat and heat from the surface of the skin, which can reach cooling effect. CREATIVE SILICONE ANTI-SLIP STRIP DESIGN: Arm Sleeves have the whole pressure line on the top and bottom circumference. 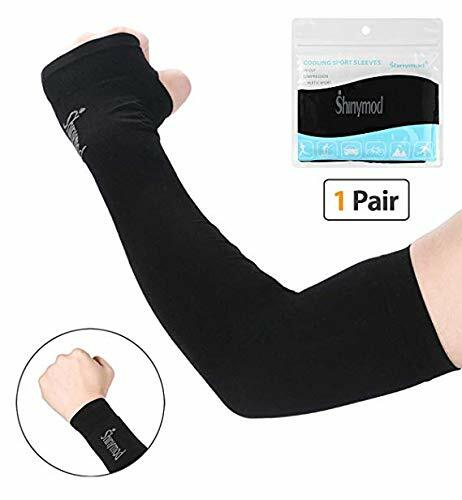 This design not only prevent our arm sleeves from slipping down effectively, but also generate centralized pressure on the protective parts--your arms. 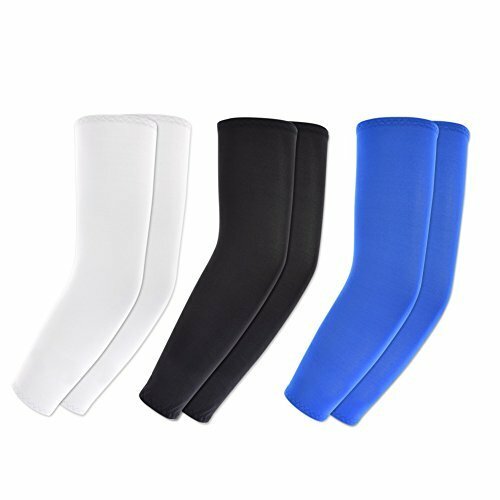 SUN PROTECTION HIGH-ELASTICITY NYLON FABRIC: HuiYee arm sleeves (85% Polyamide & 15%Spandex), smooth material, 0 pilling, protect against UV rays effectively, Anti-UV index up to 30+, designed for outdoor sports and activities. CONFORM WITH THE ARMS STRUCTURE OF HUMAN BEING: Standard cutting, unrestrained, non-deformable body shape. Furthermore, it can prevent our arms suffering from pain, sprains, muscle disorder and injured, reduce lactic acid accumulation, speed up the recovery after exercise. SIZE & LIFETIME GUARANTEE: our arm sleeves are not average size but M, L, XL, three sizes. Our customers were very pleased to get such amazing products at an affordable price. They are worthy to be wore because they look so cool, good quality and durability. If you do not love them after your purchase, 100% money back is promised. Here is no risk purchase, why not adding to your cart to have a try? The EXski sleeves feature with 99.8% UV protection from UVR, UVA and UVB rays. No more worry be exposed to blazing sun or bug bites. Ice-cooling material is very soft and skin-friendly. It keeps your arms from sunburn and helps to stay cool and fresh all day long. 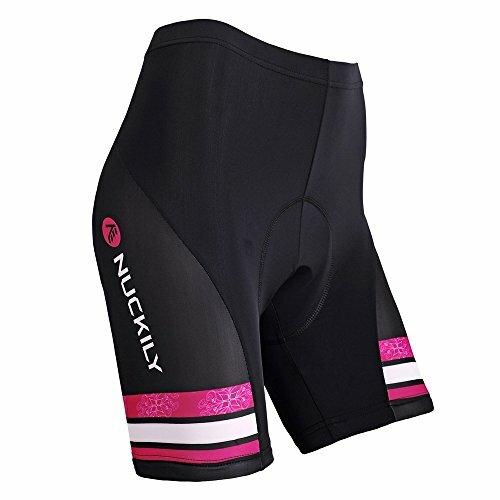 It is highly breathable and moisture-wicking quickly, very easy to clean and quick dry. No pilling, no tight fit. Fit for all sizes men and women.The specially designed pull tab on the middle and the ring finger makes it easier to take off without tearing. Pls help to measure your mid-upper arm circumference with a soft ruler before purchasing. 1. Best hand wash in cold water or 30 degree warm water, let it dry in the shade. 2. Soak with soap, then rub it gently, no hard brushing to avoid pilling. 3. Pls wash it separately in case of dyeing by the deep color clothing. 4. No bleach, no ironing, no exposure on the sun. All-round UV Protection: The arm sleeves with half finger gloves design well protect both your arms and hands from 99.8% UVA and UVB rays harm, no need sunscreen, suitable for those thin skins. Cooling and Elastic: Made from ice protofilament which is soft and breathable, sweat wick away quickly, keeping your arms fresh all day long. The high elasticity makes it suit for most bicep size from 7.5-14.5 inches. No pilling, no tight fit, no deformation. Easy Off and Skid Proof: The fingertip pads make it easy to take off the gloves without tearing. Elastic band on the upper arm allows maximum freedom of movement, keeping the sun sleeves in place without slipping down or bunch up. Anti-slip Palm: All covered silicone dots palm enhances hands grip, skid proof for grapping bicycle handle, steering wheel etc. Making your outdoor activities safer and free. Summer Days Best Choice: No worry be exposed to blazing sun; protect your new tattoo from sunburn. A must-have for cycling, driving, running, golfing, fishing, boating, gardening, basketball etc. Arm muscles stay warm and active with compression technology - Protects skin from abrasions - hDc Moisture Management Technology is all about cool and dry - 6-thread flat-lock technology for strength at the seams - 50+ UV skin protection - 80% nylon/20% spandex Sizing (Measure around bent elbow) - S: 8-9.5" - M: 9.5-11" - L: 11-13", available as single sleeve and pair. How to wash:Hand wash Cold,Hang or Line Dry " Delivery Time: The estimated delivery time usually will take about 13-25 working days to arrive by Standard delivery, please ignore the Amazon delivery time. Note: Please compare the size chart carefully before order. Please don't only judge by the size ""S,M,L,XL"", just look carefully the detail of size data, which is the new reversion US SIZE! please allow 1-3cm differs due to manual measurement, thanks (1 cm=0.39 inch,1 inch=2.54 cm) Service: If you any problem about our items, Please send message to us,We will try to our best service to resolve your issues. If you want more products, please click on the top blue shop name-iYBUIA , you can also tell us by e-mail you want the style, we will try to serve you. Hope you have a nice time on shopping! Thanks! If you are satisfied with our product or service,please leave your positive feedback! Thanks so much!" Our arm sleeves will keep you comfortable in all Sports & outdoor activities. Here is our advantage. -Featured Korean high-end ice silk fabrics, put temperatureon down in 5 (41 ) once wearing on, also protecting skin Injured from sun and UV, allowing you to freely enjoy outdoor activities. 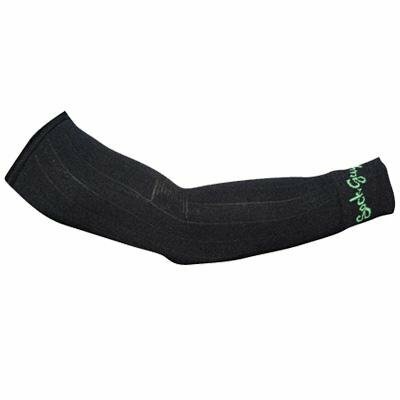 - Extremely elastic cooling arm sleeves, allow maximum freedom of movement without slipping down. -High quality material, this arm cover is not easy to snag and pilling. - Our ice silk sleeves net weigh 0.08 lb(37g )for each pair, which is not the cheap one like other sellers. -It is perfect accessory for summer training, racing and recovery. Its compression reduces damaging muscle vibrations. -Apply for men & women & youth at shooting, basketball, baseball, football, tennis, golf, cycling, volleyball, climbing, fishing ,running,driving and so on. Before unstretched: Length is 14.6 inch(37cm),upper elbow's wide is 4.1 inch(10.5 cm), wrist's wide is 3.1 inch(8cm). Our uv arm sleeve will make you feel cool, but don't like an ice feeliing. Special manufacturing techniques will warm you up in winter. So it is applicable all year round. 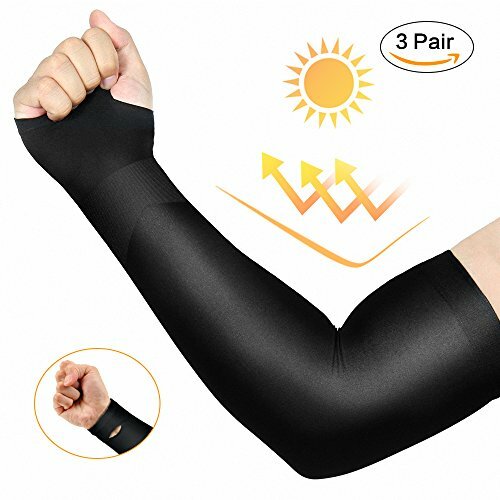 3 Pairs UV Protection Cooling Arm Sleeves: Protecting skin from 99.8% UV, without sunburn or bug bites,keep your arm fresh all day. Three colors can always match your dress. 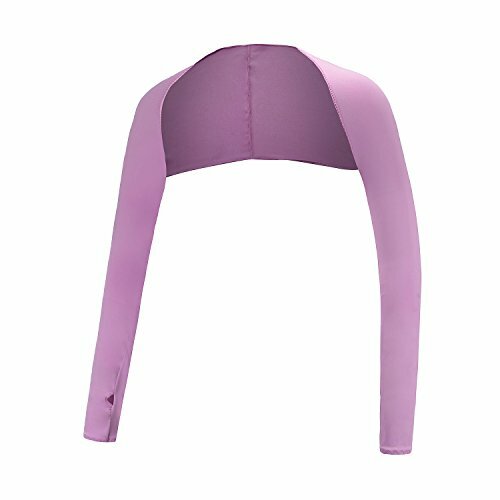 Special Protection: With innovative technology,these cooling arm sleeves will be absolutely cool in summer when wear on. However, it also can make your arm warmer in winter. Fits Your Arm Perfectly: The length can vary from 15 inches to 48 inches, a good size for bicep in 8inch - 13inch. 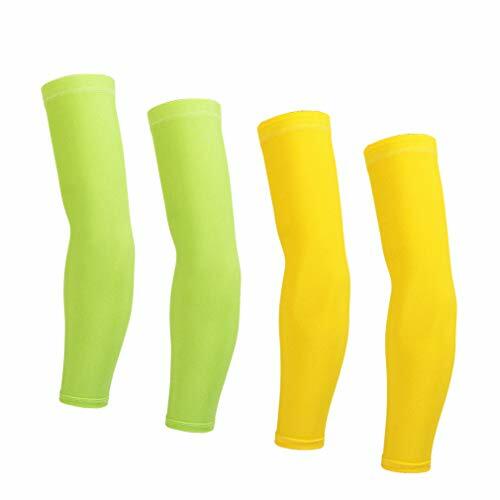 Comfortable Arm Cover: 92% polyamide,and 8% spandex, it is soft and with a good elasticity. Making your muscle feel comfortable when doing sport. Apply for Outdoor Activities: whether you're golfing, fishing, playing basketball, cycling, hiking, driving ,gardening,working, it will be a nice solution .And even cover your tattoos well. JPOJPO sport arm sleeves help you solve these all problems. Just go out to enjoy sports! Can use a neutral detergent to wash in 30 water temperature. About Size - JPOJPO arm sleeves is unisex. For the size, please look Size Chart. Measure your biceps. 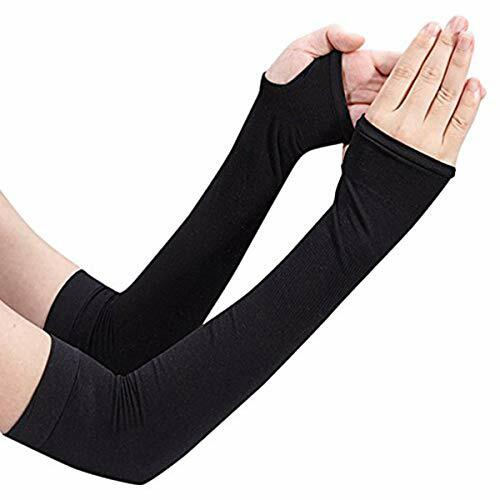 Excellent Tear Resistance and Anti-slip Unlike other inferior arm sleeves that can be easily ripped off, ours are elaborately sewed with high-quality articulated seaming. Featured with anti-slip gels inside of which better stick on your skin. Micro-denier acrylic regulate temperature and wick moisture. Arm cuffs keep warmers in place. Articulated elbow prevents bunching. Wide elasticized wrist cuff stays in place. Softest arm warmers in the industry. * In summer, sunscreen! Maintain body heat in the winter! * Sweat quickly exhaust, air-absorbing comfort fiber * Both arms, one set for the 2p * Arm protection, UV protection, cool feeling * Adjust levels of harmful bacteria and neutralize the smell of sweat * Standard quick moisture absorption than cotton and water repellency * Advanced use of yarn compensation, improve muscle function * Outdoor sports; golf / hiking / fishing / cycle / tennis / football / baseball / jogging * Indoor Sports; squash / fitness / aerobics / Bowling / Tennis / Racquetball * works; skin for protection when working with various indoor and outdoor. * Family, friends and colleagues as a gift to the right. * Company promotional materials, promotional mass available for purchase. UV protection, High elasticity fabric : No pressure or discomfort in any activity comfortable. Unisex and Free Size: High elasticity, does not creep down from your upper arm, fit very well, no pressure or discomfort in any activity. Improve the elasticity and resilience of all ages can wear free size. Product information: Gender:Women Season:Summer,Spring Occasion:Daily Material:Polyester Decoration:Lace Clothing Length:Regular Pattern Type:Solid Sleeve Style:Regular Style:Fashion,Causal Collar:O-Neck Sleeve Length:Sleeveless Package include:1PC Shirt Size US UK EU Bust Length S 6 10 36 90cm/35.4" 68cm/26.8" M 8 12 38 94cm/37.0" 69cm/27.2" L 10 14 40 98cm/38.6" 70cm/27.6" XL 12 16 42 102cm/40.2" 71cm/27.9" 2XL 14 18 44 106cm/41.7" 72cm/28.3" 3XL 16 20 46 110cm/43.3" 73cm/28.7" 4XL 18 22 48 114cm/44.9" 74cm/29.1" 5XL 20 24 50 118cm/46.5" 75cm/29.5" " Delivery Time: The estimated delivery time usually will take about 13-25 working days to arrive by Standard delivery, please ignore the Amazon delivery time. Note: Please compare the size chart carefully before order. Please don't only judge by the size ""S,M,L,XL"", just look carefully the detail of size data, which is the new reversion US SIZE! please allow 1-3cm differs due to manual measurement, thanks (1 cm=0.39 inch,1 inch=2.54 cm) Service: If you any problem about our items, Please send message to us,We will try to our best service to resolve your issues. If you want more products, please click on the top blue shop name-iYBUIA , you can also tell us by e-mail you want the style, we will try to serve you. Hope you have a nice time on shopping! Thanks! If you are satisfied with our product or service,please leave your positive feedback! Thanks so much!" Welcome to "iYBUIA" shop, iYBUIA is a focus on women fashion store.If you are not satisfied with the size you purchased or any problems after receiving the item,please feel free to contact us and we will reply you within 24 hours,our shop offer a return or exchange service for all sale goods .Thank you for your understanding and support! Please feel free to purchase our products, we will give you the best service.we will pay for the delivery fee,if there is any quality or wrong dispatch items. Important Notice: Please note the size chart in the picture, which is the actual length of the dress, and choose the size according to it. The Amazon size chart is not ours. DO NOT USE IT !! !Asian Size which is smaller than US size, please choose Larger One Or Two Size. application summer outdoor activities such as cycling, fishing, driving, golf, and so on.